Cathy, rejoice: research has suggested that eating chocolate reduces not just the risk of heart disease, but that of stroke and diabetes as well. According to ABC, a review of several studies shows that consuming lots of chocolate is linked with a 37% reduced risk of heart disease, 31% reduced risk of diabetes, and 29% reduced risk of stroke. Studies have long shown that chocolate could have health benefits — this one, according to Yale's Dr. David Katz, "shows us that the association between habitual intake of chocolate and lower cardiometabolic risk is 'statistically robust.'" 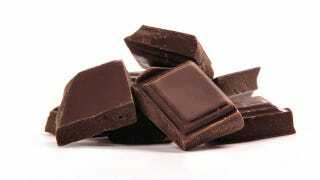 However, he points out, it doesn't necessarily prove chocolate makes you healthier — "what if happier people eat more chocolate, and are at lower cardiometabolic risk because they are happier? This paper cannot address such subtleties." I thought you were supposed to eat chocolate when you were miserable and alone with your cats. But of course, the good doctor has a point — maybe people who eat chocolate are doing something else healthy. The study controlled for age, exercise, BMI, smoking, and even non-chocolate dietary factors, but scientists can't control for everything. One possibility: people who eat chocolate are also people who allow themselves to enjoy things, even if they might contain some fat. Or maybe eating a brownie just helps people soothe their "aacks" before they have a coronary.